Rho family GTPases, the prototypical members of which are Cdc42, Rac1, and RhoA, are molecular switches best known for regulating the actin cytoskeleton. In addition to the canonical small GTPases, the large GTPase dynamin has been implicated in regulating the actin cytoskeleton via direct dynamin-actin interactions. The physiologic role of dynamin in regulating the actin cytoskeleton has been linked to the maintenance of the kidney filtration barrier. Additionally, the small molecule Bis-T-23, which promotes actin–dependent dynamin oligomerization and thus, increases actin polymerization, improved renal health in diverse models of CKD, implicating dynamin as a potential therapeutic target for the treatment of CKD. Here, we show that treating cultured mouse podocytes with Bis-T-23 promoted stress fiber formation and focal adhesion maturation in a dynamin-dependent manner. Furthermore, Bis-T-23 induced the formation of focal adhesions and stress fibers in cells in which the RhoA signaling pathway was downregulated by multiple experimental approaches. 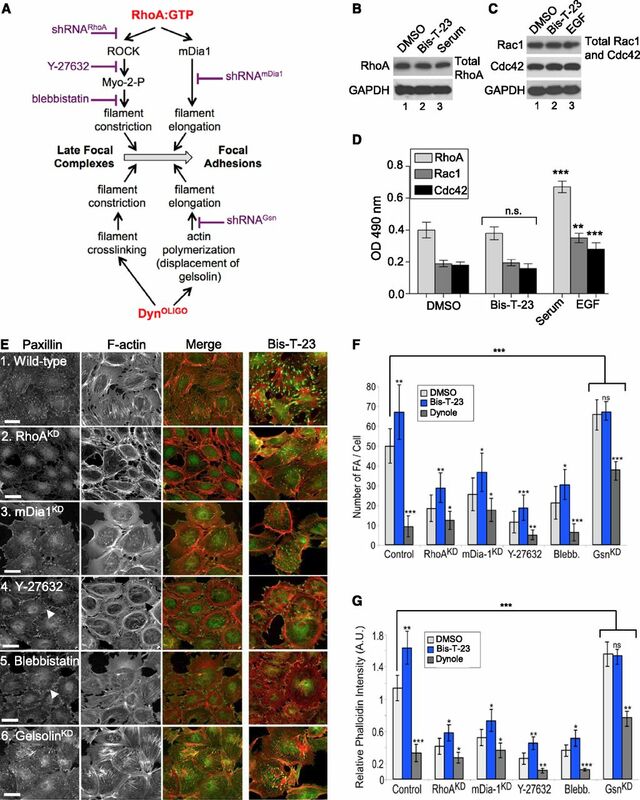 Our study suggests that dynamin regulates focal adhesion maturation by a mechanism parallel to and synergistic with the RhoA signaling pathway. 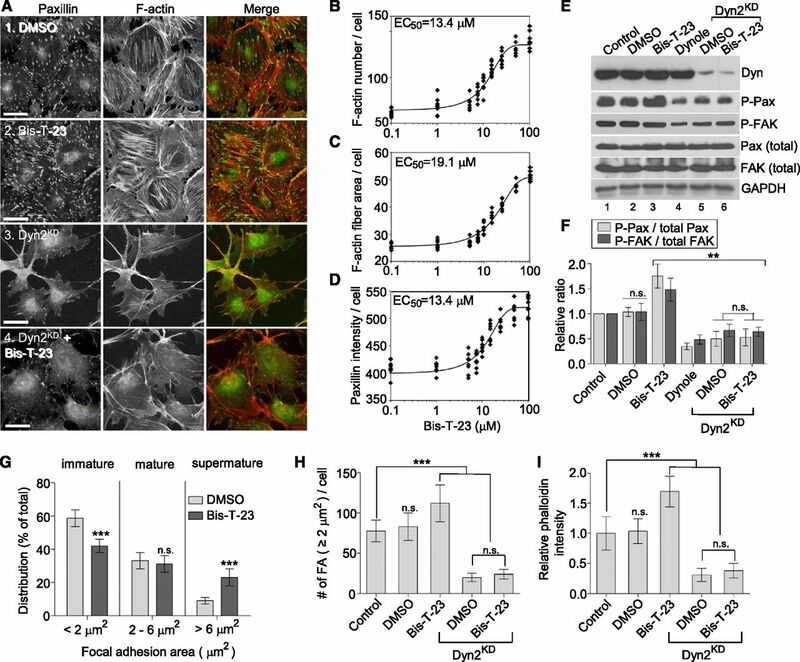 Identification of dynamin as one of the essential and autonomous regulators of focal adhesion maturation suggests a molecular mechanism that underlies the beneficial effect of Bis-T-23 on podocyte physiology. Cells exhibit the extraordinary ability to adjust their cytoskeletal organization with regard to changes in their immediate surroundings.1,2 Because podocytes are exposed to filtration forces, their ability to efficiently adhere to the basement membrane is critical for their role in maintenance of the kidney filtration barrier. As such, podocyte detachment is a key factor for CKD progression.3–5 Focal adhesions (FAs), integrin–based multiprotein complexes tightly associated with the actin cytoskeleton, comprise the cellular machinery essential for the interactions of the cells with their environment. Synergistic integrin-syndecan signaling and alternating activation cycles of the Rho family GTPases Cdc42, Rac1, and RhoA play an essential role during FA formation and maturation.6 Interestingly, whereas mice lacking Cdc42 in podocytes developed proteinuria and foot process effacement and ultimately died as a result of renal failure,7,8 mice lacking Rac1 or RhoA were overtly normal and lived to adulthood.7,8 Additionally, a large GTPase dynamin was also found to be essential for kidney function.9,10 Although dynamin is best known for its role in endocytosis,11 dynamin also promotes actin polymerization via direct dynamin-actin interactions.12,13 In this study, we examined the possibility that dynamin might regulate FA maturation in podocytes via a parallel signaling pathway to RhoA. To induce actin polymerization, dynamin must form DynOLIGO.12 The availability of Bis-T-23 (Aberjona Laboratories, Inc., Woburn, MA) allowed us to examine whether DynOLIGO–induced actin polymerization affects the formation of FAs and stress fibers in podocytes. The effect of Bis-T-23 on the actin cytoskeleton in mouse podocytes (Figure 1A) was examined using a fully automated high–throughput assay that measures distinct parameters in thousands of cells (each diamond in Figure 1, B–D represents data averaged from one well with 200–300 cells; six wells were used per condition). Bis-T-23 resulted in the doubling of the amount of stress fibers per cell (Figure 1B), the doubling of their thickness (Figure 1C), and an increase in the intensity staining for paxillin at FAs (Figure 1D). The EC50 for all three parameters was approximately 13.5 μM, approximately equivalent to the EC50 for DynOLIGO as determined in vitro (EC50 is approximately 12.5 μM).14 Maturation of focal complexes into stress fiber–bound FAs is associated with changes in protein composition and tyrosine phosphorylation and a corresponding increase in size.15 In accordance with immunofluorescence data (Figure 1D), Bis-T-23 leads to an approximately 1.5-fold increase in the levels of phosphorylated paxillin (p-paxillin) and phosphorylated FAK without affecting their overall levels (Figure 1, E and F), whereas the addition of the dynamin inhibitor Dynole (Abcam, Inc., Cambridge, MA)16 exhibits the opposite effect (Figure 1, E and F). Bis-T-23 also markedly augments the intensity of p-paxillin, zyxin, and dynamin at FAs (Supplemental Figure 1, A–C). Electron microscopy of podocytes treated with Bis-T-23 shows an increase in the number of dynamin-rich centers (Supplemental Figure 1, E, red circles and F).17 Previously, we have shown that dynamin clustered with paxillin on actin filaments, marking those clusters as FAs.12 Finally, analysis of the size of FAs using confocal microscopy reveals a decrease in the number of immature focal complexes and a subsequent increase in extralarge FAs (Figure 1G) that contain an increase in p-paxillin (Supplemental Figure 1, B and D). DynOLIGO induces formation of FAs and stress fibers. (A) Wild–type or Dyn2KD mouse podocytes were treated with 30 μM Bis-T-23 or 0.1% DMSO (vehicle control) for 30 minutes. FAs and actin filaments were visualized with anti-paxillin antibody and rhodamine-phalloidin, respectively. Scale bar, 20 μm. (B–D) Dose-response curves showing the effects of increasing concentrations of Bis-T-23 on (B) the number of actin fibers, (C) the thickness of actin fibers, and (D) paxillin intensity. Each data point represents the value calculated from a single well (approximately 1500 cells per well). (E) Western blot analyses of dynamin and FA proteins in wild–type or Dyn2KD mouse podocytes after indicated treatments and (F) bar graphs depicting the ratio of phosphorylated proteins to total proteins normalized to the control cells. The data are plotted as means±SD (n=3). **P<0.01. (G) Bar graphs depicting distribution of FAs on the basis of their size. Data represent measurements of >50 cells and are plotted as means±SD (n=3). ***P<0.001. (H and I) Bar graphs depicting the numbers of (H) FAs and (I) actin fibers under the conditions indicated. Data represent measurements of >50 cells and are plotted as means±SD (n=3). ***P<0.001. To test whether the effect of Bis-T-23 on the FAs was dynamin dependent, Bis-T-23 was added to cells in which the ubiquitously expressed dynamin 2 (Dyn2) isoform had been downregulated using a short hairpin RNA.12 Downregulation of endogenous Dyn2 (Dyn2KD) results in a striking loss of both FAs and stress fibers, with concomitant dramatically altered cell shape (Figure 1, A, H, and I).12 Bis-T-23 fails to restore both FAs and stress fibers in Dyn2KD cells (Figure 1, A, H, and I). Furthermore, in Dyn2KD cells, Bis-T-23 is unable to stimulate the phosphorylation of FA proteins (Figure 1, E and F). Of note, although the neuronal isoform, Dyn1,11 is expressed in podocytes at low level, it seemed to be insufficient to support the Bis-T-23–induced FA formation, suggesting that Bis-T-23 required the presence of Dyn2 to exert its effect on the FAs. We next examined the effects of Bis-T-23 on stress fibers and FAs in cells overexpressing similar levels of various dynamin mutants (Supplemental Figure 2, A and B). Dyn1K/E, a mutant impaired in actin binding, exhibited a dramatic loss of FAs and stress fibers.12 The addition of Bis-T-23 failed to rescue these phenotypes (Supplemental Figure 2, C–E), despite the fact that Bis-T-23 induced its oligomerization in vitro.14 Similar phenotypes were observed in podocytes expressing Dyn1I690K (Supplemental Figure 2, C–E), an oligomerization-incompetent mutant.18 Conversely, Dyn1E/K, a mutant with an increased affinity for actin, increases the amount of stress fibers and FAs (Supplemental Figure 2, C–E). We have previously shown using fluorescence lifetime imaging microscopy that Dyn1E/K exhibited a heightened propensity for actin-dependent oligomerization in podocytes.14 The extent of Dyn1E/K oligomerization in podocytes is comparable with that observed for Dyn1 in the presence of Bis-T-23. Thus, the observed effects on the stress fibers and FAs shared by Dyn1E/K and Bis-T-23 and the inability of Bis-T-23 to promote oligomerization of Dyn1K/E and Dyn1I690K in cells together support the hypothesis that actin-dependent DynOLIGO plays a role in the formation of FAs and stress fibers. Of note, Dyn1E/K and Dyn1K/E exhibited no effect on endocytosis,12 which is consistent with the wild–type biochemical characteristics of the mutants.12,14 In addition, Bis-T-23 has no effect on lipid–dependent dynamin oligomerization.14 Furthermore, the dynamin mutant impaired in interactions with known actin binding proteins, such as cortactin, was originally shown to be able to rescue formation of FAs and stress fibers in Dyn2KD cells.12 Finally, the inability of Bis-T-23 to rescue dominant negative phenotypes of Dyn1K/E and Dyn1I690K in cell culture is consistent with the failure of Bis-T-23 to ameliorate proteinuria in zebrafish expressing Dyn1K/E or Dyn1I690K.13 Together, these data suggest that DynOLIGO regulates the formation of stress fibers and FAs independent from its role in endocytosis. We next asked whether the observed effects of Bis-T-23 in the cell were dynamin autonomous or whether dynamin acted, in part, by altering RhoA signaling. As depicted in Figure 2A, RhoA plays a role in the assembly of stress fibers and FAs by stimulating its downstream effectors: Rho–associated protein kinase (ROCK) and mammalian Dia 1 (mDia1).6 Dynamin’s ability to induce actin polymerization by displacing gelsolin and its ability to crosslink actin filaments12 suggest a parallel pathway for FA maturation (Figure 2A). Although the Bis-T-23–induced phenotype was similar to that of the activated form of RhoA,19 Bis-T-23 treatment did not alter either overall levels or those of GTP-bound forms of RhoA, Rac1, and Cdc42 (Figure 2, B–D). In these ELISA-based assays, serum and EGF were used to activate RhoA and Rac1/Cdc42, respectively (Figure 2D). Together, these data suggest that the effect of Bis-T-23 in cells is not associated with other GTPases. DynOLIGO regulates actin cytoskeleton independently from RhoA signaling. (A) Schematic diagram of parallel signaling pathways mediated by two GTPases, RhoA and dynamin, for the formation of FAs. (B and C) Western blot analyses of (B) total RhoA and (C) Rac1 and Cdc42 levels in podocytes. (D) Bar graphs depicting the amount of GTP-bound RhoA, Rac1, and Cdc42 in podocytes. The data are plotted as means±SD (n=3). **P<0.01; ***P<0.001. (E) Organization of the actin cytoskeleton and FAs in podocytes in which Rho-dependent signaling has been downregulated by diverse strategies. RhoAKD, mDia1KD, or GelsolinKD cells were infected with adenoviruses expressing short hairpin RNA (shRNA) against respective proteins. Where indicated, cells were treated with blebbistatin (20 μM) or Y-27632 (10 μM) for 30 minutes. Bis-T-23 (30 μM) was subsequently added for 30 minutes before fixation. FAs and stress fibers were visualized with anti-paxillin antibody and rhodamine-phalloidin, respectively. White arrowheads in panels 4 and 5 indicate FAs formed at the cell membrane, and the black arrowhead in panel 4 indicates actin arcs. Scale bars, 20 μm. (F and G) Bar graphs depicting the numbers of (F) FAs and (G) stress fibers after the RhoA signaling has been impaired. Of note, FAs formed at the plasma membrane were not counted. Data represent measurements of >50 cells as shown in E and are plotted as means±SD. *P<0.05; **P<0.01; ***P<0.001. We next examined whether Bis-T-23 could induce the formation of FAs and stress fibers, even after RhoA signaling has been impaired. Downregulation of RhoA (RhoAKD) (Supplemental Figure 3, A and B) or one of its downstream effectors mDia1 (mDia1KD) (Supplemental Figure 3, C and D) using short hairpin RNA results in a loss of FAs and stress fibers (Figure 2, E–G). Bis-T-23 partially rescues, whereas dynamin inhibitor Dynole further decreases both of the parameters (Figure 2, F and G). Furthermore, the inhibition of ROCK by Y-27632 or myosin II activity by blebbistatin significantly lowers the number of FAs and stress fibers within the cell body but increases the number of both parameters in the vicinity of the membrane (in Figure 2E, white arrowheads mark FAs located in the membrane vicinity, and the black arrowhead marks actin arcs). Once again, the addition of Bis-T-23 partially restores both parameters within the cell body (Figure 2, E–G). In cells treated with Y-27632, Bis-T-23 increases the formation of free barbed ends (Supplemental Figure 3, E–G), concomitant with increased level of p-paxillin without affecting its total level (Supplemental Figure 3H). Together, these data provide additional evidence that DynOLIGO plays a major role in FA maturation, most likely by stimulating actin polymerization. Experiments using pure proteins suggested that DynOLIGO induces actin polymerization by displacing gelsolin from the barbed ends.12 Downregulation of gelsolin (GsnKD) (Supplemental Figure 4, A and B) increases the number of FAs and results in thicker stress fibers (Figure 2, E–G), suggesting that gelsolin regulates actin turnover in podocytes. Of note, gelsolin has been implicated in actin turnover in platelets.20 Bis-T-23 does not exhibit any additional effects on FAs in GsnKD cells (Figure 2, E–G), suggesting that DynOLIGO and gelsolin act on the same pathway. Finally, Bis-T-23 induces the formation of stress fibers and FAs in undifferentiated podocytes (Supplemental Figure 4, C–E). It has been suggested that, in the absence of synaptopodin (the adaptor protein expressed only in differentiated podocytes), the amount of active RhoA in undifferentiated podocytes is overall decreased.21 Together, our study provides compelling evidence that Dyn and RhoA regulate the formation of stress fibers and FAs in podocytes via synergistic pathways that converge at the most downstream effector: actin filaments. Dynamin is a well established regulator of actin-dependent processes, such as actin comets generated by Listeria,22 centrosome cohesion,23 or cell migration.12 Dynamin’s ability to affect the actin cytoskeleton has been linked to its GTPase activity from the beginning, but identified interactions between dynamin and cortactin or SNX9 were known to be GTPase independent.11 The identification of GTP– and actin–dependent dynamin oligomerization and its ability to induce actin polymerization12 suggested a novel mechanism by which dynamin regulates actin cytoskeleton.24 Indeed, direct dynamin-actin interactions have been recently implicated in the formation of lamellipodia25 and flipodia26 and regulation of the cortical actin cytoskeleton during endocytosis in yeast.27 Interestingly, our study shows that, despite the lack of phenotype in animals lacking RhoA, impairment in the RhoA downstream effectors, such as ROCK or mDia1, resulted in pronounced loss of FAs and stress fibers. Rho/mDia signaling has been associated with formation of lamellipoda, which in podocytes, required interactions between mDia and inverted formin 2.28 Because mutations in inverted formin 2 are a common cause of familial FSGS, together, these insights emphasize the cell type specificity for the same major signaling pathways. The ability of dynamin to bypass multiple actin binding and regulatory proteins involved in the canonical pathways, such as RhoA (this study) and maybe even Cdc42 and Rac1, makes dynamin a unique pharmacologic target for altering actin cytoskeleton dynamics. Bis-T-23 and Dynole were used as previously described.14 A conditionally immortalized mouse podocyte cell line was grown as described.29 The high–throughput fluorescence microscopy was performed by imaging cells in 96-well optical plates using the Opera LX High-Content Confocal Imaging System (PerkinElmer, Waltham, MA) with appropriate filters. The images were analyzed using the Columbus 2.3.1 High-Content Screening Image Data Storage and Analysis System (PerkinElmer) as described.30 The activation of small G proteins was determined using the G-LISA Activation Assay Biochem Kit (BK124, -127, and -128 for RhoA, Rac1, and Cdc42, respectively) from Cytoskeleton (Denver, CO) according to the manufacturer’s instructions. For actin and paxillin quantification, images were captured with a Zeiss LSM 5 PASCAL Laser-Scanning Microscope (Carl Zeiss GmbH, Jena, Germany) and a 40× objective. Electron microscopy of the podocyte cytoskeleton was performed as described.12 Detailed methods are available in Supplemental Material. J.R., V.G., and S.S. have pending or issued patents on novel kidney–protective therapies that have been outlicensed to Trisaq Inc. (Miami, FL), in which they have financial interest. In addition, they stand to gain royalties from their commercialization. The authors thank Tristan Hays for his technical help and discussion. This work was supported by National Institutes of Health grant R01DK093773 (to S.S.). This article contains supplemental material online at http://jasn.asnjournals.org/lookup/suppl/doi:10.1681/ASN.2016010008/-/DCSupplemental.